In group discussions, debates about issues are informal and sometimes fast-moving. They can move so quickly that the group's members don't realize that they have reached incorrect conclusions. When this happens, one or more rhetorical fallacies probably played a role — accidentally or intentionally inserted by one of the group's members. A structure on the Mississippi River, built by the US Army Corps of Engineers (USACE), and known as the Old River Control Structure. It's part of a complex whose purpose is controlling the flow from the Mississippi into a distributary known as the Atchafalaya River. Were it not for this facility, the Mississippi would long ago have rerouted itself into the Atchafalaya, which has a much steeper gradient to the ocean. 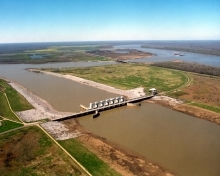 Since that change would have deprived New Orleans and all the industrial facilities along the lower Mississippi of access to the water and navigational channels they now enjoy, USACE maintains a complex of flow control facilities to prevent nature taking its course. But this project, together with a multitude of levees, dredging projects, and gates throughout lower Louisiana, has had unintended consequences, including erosion of the Louisiana shoreline at the rate of 50 square miles per year. The entirety of the intervention can be viewed as an example of the Fallacy of Composition: even though each element of the whole intervention makes sense, the whole of the result might not. For more about Atchafalaya, see the famous article by John McPhee, which appeared in the February 23, 1987, issue of The New Yorker. Photo by Michael Maples, courtesy U.S. Army Corps of Engineers. Since the global economy is in recession, and our jobs are less secure than they once were, everyone should pay off their debts and increase the fraction of their income that they save. If we were to follow this advice, the recession would quickly become a depression, because economic activity would contract severely. Although the statement is probably true for individuals, the conclusion about the entirety of all individuals is false. We can make up some time and get closer to the original schedule if Tim and Ellen work through the weekend. So it's probably best if everyone works every weekend for the rest of the project. If we take this approach, people will become fatigued, their work quality will degrade, some will seek reassignment, and the project might never complete. We've found serious problems in the proposal. The Localization budget is too low, and the schedule for customer extensions is too aggressive. You need to rethink the whole thing. rhetorical fallaciescomment omits any proof that the two flaws cited are justification for the final recommendation. I'm sorry I couldn't recommend you for a promotion this year. You had some trouble working with Fran, and there were also problems with Leo. You need to learn how to work better with people. Perhaps the conclusion above is correct, but two difficult relationships are probably not adequate proof. For instance, if both Fran and Leo have problems with everyone, perhaps the problem isn't Glen's. This application of the Fallacy of Composition offers a convenient alternative to justifying decisions made for other reasons. Would you like to see your comments posted here? rbrenIfMwtwDnKkNEOnKaner@ChacQNXMIZpOpqKlWGsSoCanyon.comSend me your comments by email, or by Web form. See also Effective Meetings, Critical Thinking at Work and Rhetorical Fallacies for more related articles. I offer email and telephone coaching at both corporate and individual rates. Contact Rick for details at rbrencNgAgTieHiEmZwsKner@ChacHEVSWKGhMFJoTzWyoCanyon.com or (650) 787-6475, or toll-free in the continental US at (866) 378-5470.